We have, beyond a doubt, dawned on a new era: the era of online stalking. Whenever anyone wants to know more about you, you can bet your life they turn to Google. For people searches, Linkedin profiles tend to show up higher in search engines results when compared to other websites. This is why you should be taking this opportunity to create and maintain a professional presence on Linkedin to leave a great impression on anyone (especially potential employers) who might be lurking around your profile. The first step to a professional Linkedin presence is a professional e-mail address. It is advisable not to use your work e-mail because you might not have access to it indefinitely and it might be monitored by your employer- not a great idea if you’re looking for another job. DO Create a professional email address using your first name and last name or first initial and last name. DON’T Email addresses like sexybeast69@aol.com or puppy_loveXOXO@msn.com will only cause a potential employer or a professional acquaintance to laugh at you. I would. Additionally, your email provider says a lot about you. DO Gmail, Live and Yahoo are generally widely acceptable and professional. For students looking for potential internships and future employment oppurtunities, using a university email address is even better, but you should ensure that you still have access to it when you graduate. If you want to go the extra mile, you can always opt in to creating your own domain and an email like me@yourname.com. It only costs you around $10 per year and it’s guaranteed to impress an employer. This has to be the simplest thing that you should do right on Linkedin. Unfortunately this seems to be one of the most oft-repeated mistakes that I see. DO Write it as you would do on any official document with proper capitalization, example: John Smith. You would be surprised how many people get this wrong. DON’T If you use lowercase (ie. john smith), no one will hire you because they will think that you’re so lazy that you can’t even bothered to capitalize your own name. Do not use all caps (ie. JOHN SMITH). Worst case scenario? Do this: jOhN sMItH- it will cause your potential employer to burn his computer monitor without continuing to read your profile. I only mention this because I’ve seen it several times on Linkedin, unfortunately. Your profile photo is the first thing that people notice on a Linkedin profile. However, it is greatly different than what your idea of a Facebook profile photo. On Linkedin, your photo should professional, and I;m sure in your own network you’ve seen some of these hilarious (read: ridiculous) images. Below are some tips that are based on real recurring observations from my network. DO Use a simple professional photo with your entire face showing clearly, and you may use a passport photo with a white background if you have no other option. Use a color photo with minimal filters or “creative” editing it should be timely. This means that it should look like what you look like now, not five or 10 years ago. Make sure that your clothes and face do not blend in with the background of your photo. Regarding staging, good image ideas include: an office photo, a photo of you while working (provided your face shows clearly), or a photo being interviewed or giving a presentation- this is called a “business action” shot. DON’T Do not have an empty profile photo and black and white photos are generally considered unacceptable. 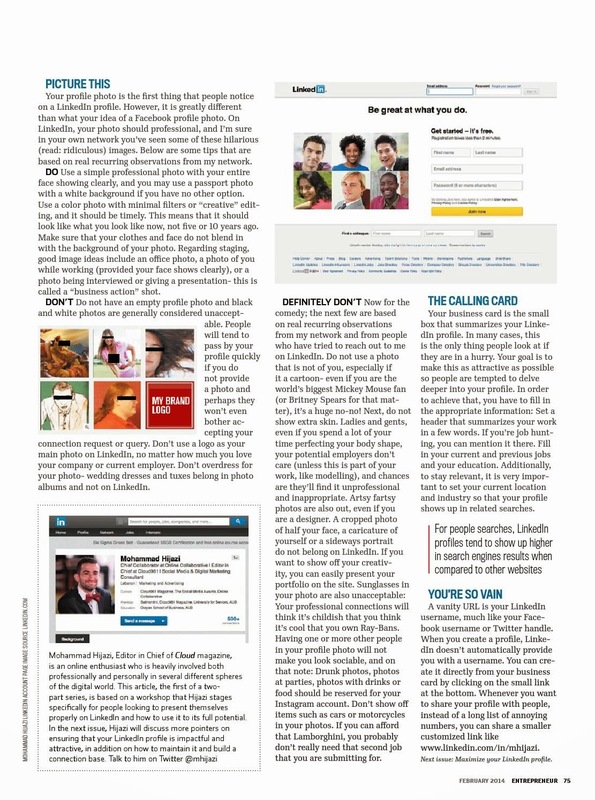 People will tend to pass by your profile quickly if you do not provide a photo and perhaps they won’t even bother accepting your connection request or query. Don’t use a logo as your main photo on Linkedin, no matter how much you love your company or current employer. Don’t overdress for your photo- wedding dresses and tuxes belong in photo albums and not on Linkedin. DEFINITELY DON’T Now for the comedy; the next few are based on real recurring observations from my network and from people who have tried to reach out to me on Linkedin. Do not use a photo that is not of you, especially if it a cartoon- even if you are the world’s biggest Mickey Mouse fan (or Britney Spears for that matter), it’s a huge no-no! Next, do not show extra skin. Ladies and gents, even if you spend a lot of your time perfecting your body shape, your potential employers don’t care (unless this is part of your work, like modelling), and chances are they’ll find it unprofessional and inappropriate. Artsy fartsy photos are also out, even if you are a designer. A cropped photo of half your face, a caricature of yourself or a sideways portrait do not belong on Linkedin. If you want to show off your creativity, you can easily present your portfolio on the site. Sunglasses in your photo are also unacceptable: Your professional connections will think it’s childish that you think it’s cool that you own Ray-Bans. Having one or more other people in your profile photo will not make you look sociable, and on that note: Drunk photos, photos at parties, photos with drinks or food should be reserved for your Instagram account. Don’t show off items such as cars or motorcycles in your photos. If you can afford that Lamborghini, you probably don’t really need that second job that you are submitting for. Your business card is the small box that summarizes your Linkedin profile. In many cases, this is the only thing people look at if they are in a hurry. Your goal is to make this as attractive as possible so people are tempted to delve deeper into your profile. In order to achieve that, you have to fill in the appropriate information: Set a header that summarizes your work in a few words. If you’re job hunting, you can mention it there. Fill in your current and previous jobs and your education. Additionally, to stay relevant, it is very important to set your current location and industry so that your profile shows up in related searches. A vanity URL is your Linkedin username, much like your Facebook username or Twitter handle. When you create a profile, Linkedin doesn’t automatically provide you with a username. You can create it directly from your business card by clicking on the small link at the bottom. Whenever you want to share your profile with people, instead of a long list of annoying numbers, you can share a smaller customized link like www.linkedin.com/in/mhijazi. 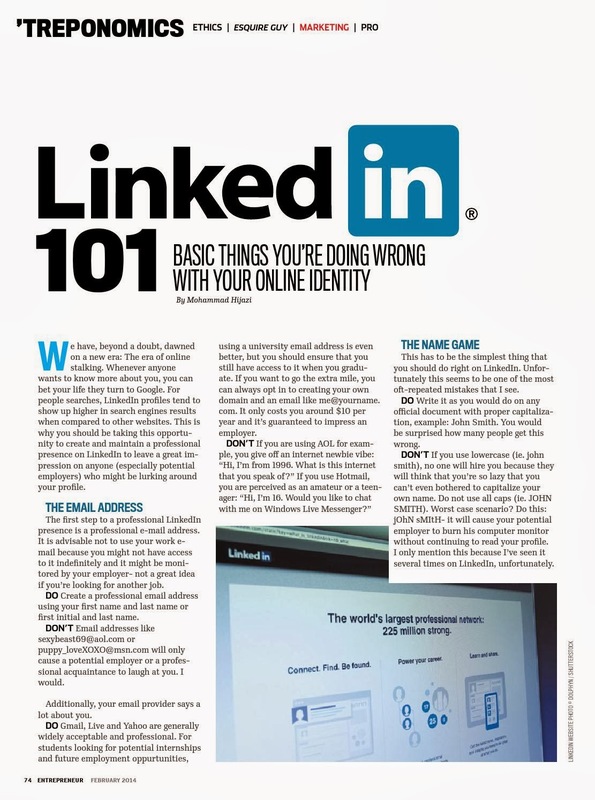 A version of this article originally appeared in Entrepreneur Middle East Magazine which I am currently contributing to. You can read the full issue here.